The Skirvin Hilton Oklahoma City first opened its doors in 1911 with two, 10-story towers and 224 guestrooms. In 1930, a third wing was added, raising the structure to 14 stories and increasing capacity to 525 rooms. After an extensive renovation project restoring the original exterior finish, installing historically accurate windows, reconfiguring guest rooms and adding new guest elevators, the hotel reopened on February 26, 2007. The new Skirvin Hilton hotel features an elegant lobby and new restaurant, the Park Avenue Grill. The Red Piano lounge located just off the lobby beckons visitors to relax and enjoy the comfortable and stylish setting of the property. The newly renovated hotel features 225 guestrooms, including 20 suites and one Presidential suite. The new Skirvin Hilton hotel is a short walk to the Cox Business Services Convention Center in Oklahoma City and includes 15,000 square feet of meeting and pre-function space. Meeting rooms incorporate state-of-the-art technology, including high-speed internet throughout. True to the legacy of its founder, W. B. Skirvin, the hotel once again stands as a proud testament to the history – and future – of Oklahoma City. 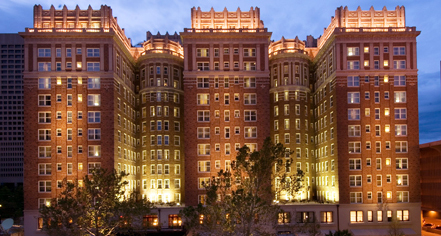 The Skirvin Hilton Oklahoma City, a member of Historic Hotels Worldwide since 2014, dates back to 1911. 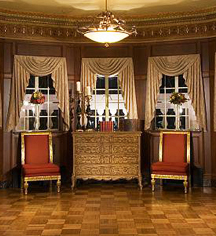 The hotel provided a safe room for guests to privately drink during the Prohibition era. Early Check-In/Late Check-Out: Early Departure Fee: 50%. Late Check-Out Fee: 50%. Based on availability. Parking: Self-parking: Not Available. Valet parking: $26.00 (Valet Parking) Secured: Available. Covered: Available. In/Out Privileges: Available. Other Parking Information: Street-side and public parking garages adjacent. Payment: All forms of payment are accepted. Payment is required at time of booking. Visa, MasterCard, Amex, Diners Club, China Union Pay, and Discover are accepted. Pet Policy: Service animals allowed: Yes. Pets allowed: Yes. Deposit: $50.00 (Non-Refundable) Maximum Weight: 60 lbs. Maximum Size: Medium. Learn more about the History of The Skirvin Hilton Oklahoma City .